This is a wonderful place, and the event of my speaking there ended up being pivotal. I was schmoozing around the country for Microship lab space and had a good friendship developing at Scripps… but there was no open facility for me to spend a couple of years doing a messy boat project on-site. I gave the talk, and we started brainstorming this challenge. This was my introduction to academia. I hung around a few days, still seeking space at the Scripps facilities, eventually managing to arrange a secure place to park the Mothership and stash my gear in a run-down storage facility in a desolate nearby canyon… but with no net connection, phone, or actual workspace. It was an excellent toehold, though, and the chain of contacts kept growing as I explored the couch circuit. 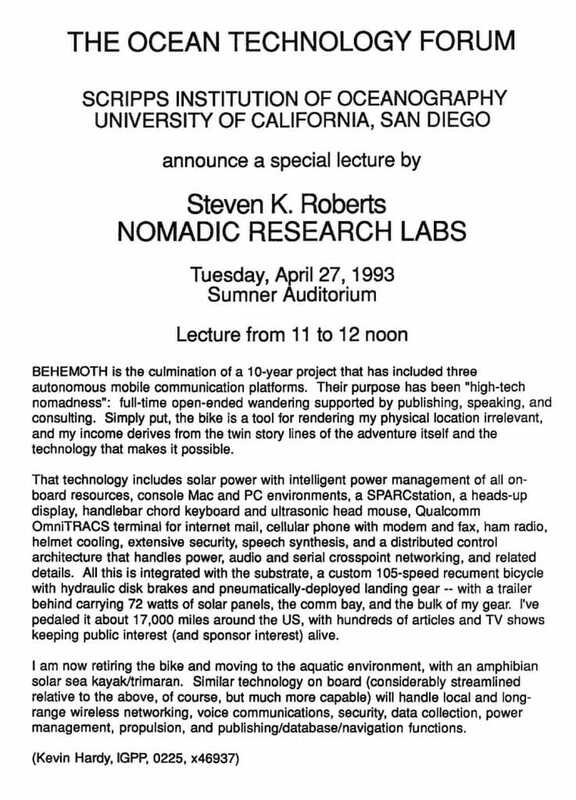 A few days later I met with Professor Clark Guest in the Electronic & Control Engineering department at UCSD (University of California, San Diego)—that huge university just up the hill from Black’s Beach in La Jolla. BEHEMOTH is the culmination of a 10-year project that has included three autonomous mobile communication platforms. Their purpose has been high-tech nomadness: full-time open-ended wandering supported by publishing, speaking, and consulting. Simply put, the bike is a tool for rendering my physical location irrelevant, and my income derives from the twin story lines of the adventure itself and the technology that makes it possible. That technology includes solar power with intelligent power management of all on- board resources, console Mac and PC environments, a SPARCstation, a heads-up display, handlebar chord keyboard and ultrasonic head mouse, Qualcomm OmniTRACS terminal for internet mail, cellular phone with modem and fax, ham radio, helmet cooling, extensive security, speech synthesis, and a distributed control architecture that handles power, audio and serial crosspoint networking, and related details. All this is integrated with the substrate, a custom 105-speed recumbent bicycle with hydraulic disk brakes and pneumatically-deployed landing gear – with a trailer behind carrying 72 watts of solar panels, the comm bay, and the bulk of my gear. I’ve pedaled it about 17,000 miles around the US, with hundreds of articles and TV shows keeping public interest (and sponsor interest) alive. I am now retiring the bike and moving to the aquatic environment, with an amphibian solar sea kayak/trimaran. Similar technology on board (considerably streamlined relative to the above, of course, but much more capable) will handle local and long- range wireless networking, voice communications, security, data collection, power management, propulsion, and publishing/database/navigation functions.